i. Prime Minister Narendra Modi inaugurated 16th International Energy Forum Ministerial Meeting in New Delhi. It is the largest gathering of Ministers from energy consuming, producing and transit countries. ii. Hosted by India and co-hosted by China and Korea, the meeting aims to focus on how global shifts, transition policies and new technologies influence market stability and future investment in the energy sector. · China Capital- Beijing, Currency- Renminbi, President- Xi Jinping. i. The tenth edition of a biennial exhibition of weapons and military hardware - DefExpo India- 2018 has begun at Kancheepuram in Tamil Nadu. The four-day long defence expo was formally inaugurated by Prime Minister Narendra Modi. ii. Indigenously developed military helicopters, aircraft, missiles and rockets, capabilities to manufacture submarines, frigates and corvettes would be showcased at the event. i. India and World Expo 2020 signed participants contract for India’s pavilion in the prestigious World Expo 2020 held once in 5 years. ii. The contract provides for the setting up of India pavilion at Expo 2020 on an extra large plot (about one acre) in the ‘Opportunity’ segment. i. President Ram Nath Kovind has asked Indian Diaspora in Zambia to become the partner in India’s growth and asked them to take advantage of Overseas Citizen of India, OCI programme. ii. Four MOUs were signed between the two countries which include, the establishment of Entrepreneurship Development Institute in Zambia, taxation, visa exemption on diplomatic passports and judicial cooperation. This is the first time in three decades that a President of India is undertaking a state visit to Zambia. · Zambia Capital- Lusaka, Currency- Zambian kwacha, President of Zambia- Edgar Chagwa Lungu. i. Jammu and Kashmir Bank has launched a special financing scheme named 'Add-on Working Capital GST' to help the state industry cope with the delay in reimbursement of GST under special tax relief. ii. The scheme was launched by J&K Finance Minister Syed Altaf Bukhari. · The Chairman and CEO J&K Bank is Parvez Ahmed. i. Balram Bhargava has been appointed the new Director General of the Indian Council of Medical Research (ICMR) and Secretary of the Department of Health Research. ii. Bhargava, currently a senior consultant cardiologist at the All India Institute of Medical Science, will carry out this role until 2021. He will succeed Soumya Swaminathan. i. Former UN Secretary-General Ban Ki-moon has been elected chairman of 'Boao Forum for Asia' (BFA). He has replaced former Japanese Prime Minister Yasuo Fukuda. ii. Founded in 2001, the BFA is a non-governmental and non-profit international organisation committed to promoting regional economic integration and bringing Asian countries closer to their development goals. i. Rishad Premji, Board member of Wipro Ltd. has been appointed as the Chairman of the National Association of Software and Services Companies (NASSCOM) for 2018-19.
ii. He succeeds Raman Roy, Chairman and Managing Director, who served as Chairman of NASSCOM for the year 2017-18. NASSCOM also appointed Keshav Murugesh as the Vice Chairman for 2018-19. · Debjani Ghosh has been recently appointed the new president of Nasscom. i. Indian shooter Shreyasi Singh won the women's double trap gold in a shoot-off after scoring 96 points to take India's gold medal tally at the 21st Commonwealth Games 2018 to 12.
ii. This was her second CWG medal after having claimed a silver at the 2014 Glasgow Games. 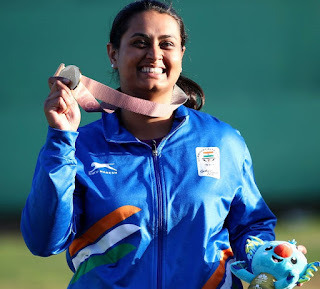 Another Indian shooter Varsha Varman finished fourth in the event, scoring 86 points. i. Indian shooter Om Prakash Mitharval settled for the bronze medal in the men's 50m pistol event at the 21st Commonwealth Games at Gold Coast, Australia. ii. Host nation Australia's Daniel Repacholi bagged the gold medal in the event with a Games record 227.2 while Shakil Ahmed of Bangladesh won the silver.